Mexico's Gun Control Laws: A Model for the United States? 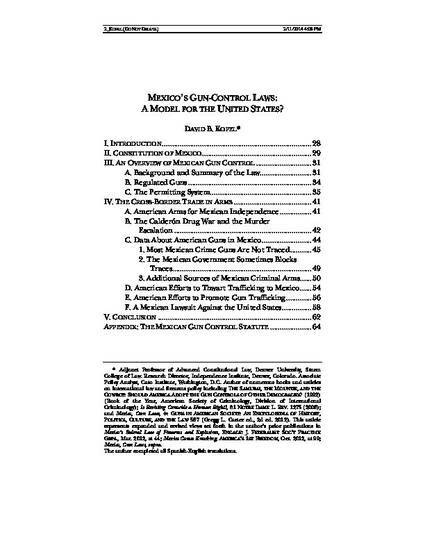 Part III explains the operation of Mexico’s gun-control system and provides some historical and statistical information about gun ownership and gun smuggling in Mexico. Part IV describes some of the past and present cross-border trade in arms between the United States and Mexico and potential legal ramifications. The Appendix provides a translation of the Mexican federal government’s current gun-control statute. The Appendix also offers some explanatory footnotes to the statute when appropriate for better understanding.